China National Gold Group Corp., the state-owned company that controls the nation’s largest gold deposits, wants to invest in projects in Africa as it expects bullion to trade near record levels for the next three years. The World Gold Council (WGC) released its quarterly “Gold Demand Trends” report last week and, as always, it was filled with fascinating data on the strength of the global gold market. Gold demand grew 11 percent to 981.3 tons during the first quarter of 2011, worth $43.7 billion at quarter-end’s price levels. WASHINGTON, May 19, 2011 /PRNewswire/ -- Seniors have lost almost one-third of their buying power since 2000, according to the Annual Survey of Senior Costs, released today by The Senior Citizens League (TSCL). TSCL is one of the nation's largest nonpartisan seniors advocacy groups. To continue with our theme on real inflation and true "cost of living," check out the chart in the article above and you'll see how much food and energy prices have gone up since last year. The numbers are eye popping! 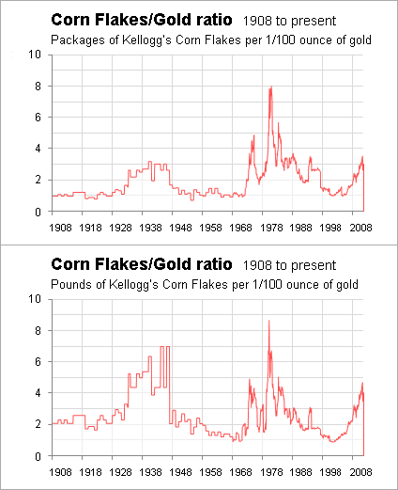 As some people who knock gold as an investment point out, "You can’t eat gold." 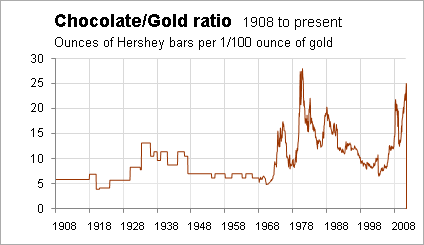 But you can eat chocolate – so what’s the gold/chocolate ratio look like these days? This article addresses the true inflation aspect of investing. Many people forget that the government's official inflation number does NOT include food & energy, which for many in retirement is the only thing they spend money on. It shows that it's very important to consider your "cost of living" when deciding on the investment you choose and whether or not that investment will maintain it's value in ACTUAL food and energy, not the currency it's measured in. 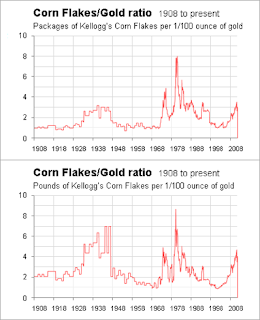 As we can see from these charts, gold is a good indicator of your cost of living and should be held in reserve in EVERY portfolio. 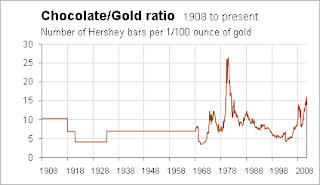 After all, why do you think Central Banks around the world are storing gold in reserve? Hong Kong Gold Exchange Opens on Wednesday! Watch out COMEX, here come 1.5 Billion Asians. This will be interesting? The U.S. Mint sold 62,000 ounces of American Eagle gold coins in the first week of May, heading for the highest monthly amount since March 1999. This month’s sales are already 57 percent of the total in April, according to the mint’s website. May sales would be about 240,250 ounces if the current pace continues. The mint sold 231,500 ounces of the coins in December 2009 and 269,000 ounces in March 1999, its website showed. Accumulate as Much Silver as You Can! To simply follow the silver price without trying to understand the extreme stress in the global paper currency system today would be folly. Since August 15, 1971, when Nixon closed the gold window, the world has been floating on a sea of fiat currencies, supported only by its one reserve currency, the U.S. dollar, which is nothing more than an I.O.U. 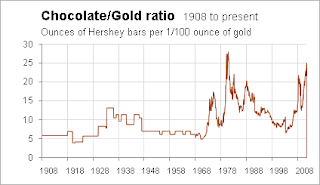 During the days of the true gold standard, a country was required to disgorge its gold reserves if it ran consistent trade deficits. Of course, these days, in the absence of the gold standard, countries have been at liberty to print as much currency as they deem fit. This has led to a scenario of competitive devaluations. We are now at a point where the smart money is losing its faith in this paper currency system, and is viewing it as a giant, Ponzi scheme, the likes of which the world has never witnessed before. 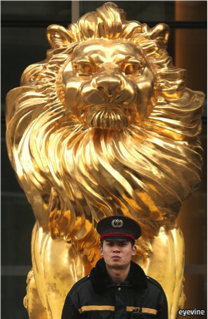 China "Aims to Have More Gold Than America"
THE CENTRAL BANKS of developing countries will Buy Gold at an increasing rate in coming years, with China being a leading player, according to a major industry figure. Rob McEwen, founder and former head of Goldcorp, now the world’s fifth largest Gold Mining company, believes central bank purchases could help push the price of gold to $2000 an ounce by the end of the year. Silver prices are flirting with $50 per ounce for the first time in decades. In North Idaho, that inevitably brings back memories of Nelson Bunker Hunt and his brother William Herbert Hunt – two Dallas billionaires who tried to corner the silver market. The brothers used their profits from Libyan oil fields to begin quietly buying up silver during the 1970s, a time of high inflation. At one point, the Hunts controlled an estimated 110 million ounces of silver. They were also major stockholders in the Sunshine Mine near Kellogg. During the Hunts’ high-stakes gamble, the price of silver briefly shot above $50 per ounce in January 1980. The brothers’ speculative buying came to an abrupt end when commodity exchange rules were modified, forcing the Hunts to put up money they didn’t have or quickly sell off their silver stocks. Silver prices tumbled rapidly over the next two months, and so did the Hunts’ fortune. By some accounts, they lost $1.7 billion. $50 of goods and services in 1980 is much different than what you can get for $50 today. Today there are NO, Hunt Brothers trying to corner the silver market, ask yourself how many people you know that are "investing" in silver bullion? Silver has been rising steadily since 2006 and it's thousands of small investors that are barely starting to get involved, not one big player. There was no iPods or Blackberry's in the 1980's. The amount of silver in an iPod will not affect the price of the iPod, BUT the number of iPods around the world will certainly affect the price of silver. The USA was still a creditor nation as opposed to now being the largest debtor nation in history. The Federal Reserve held its first press conference in its 97 year history last week. In my mind, it did this because it recognizes the deep financial trouble the U.S. is in. It wants to put a positive spin on the mess it largely created and/or allowed to happen. After all, it was Tim Geithner who was the head of the New York Fed during the go-go years of the mid 2000’s. He was supposed to regulate the big Wall Street banks. You see how well that worked out—the entire system melted down and Geithner got a promotion to Treasury Secretary. "The rise in Gold is NOT about the rise in Gold, rather the loss of confidence in the USD as the world's reserve currency." Mr. Pope is the chief executive officer of Smithfield Foods Inc., the world's largest pork processor and hog producer by volume. He doesn't mince words when it comes to rapidly rising food prices. The 56-year-old accountant by training has been in the business for more than three decades, and he warns that the higher costs may be here to stay. Courtesy of? "I'm not going to say, 'a political policy,'" he tells me. (His senior vice president, a lawyer by training, sits close by, ready to "kick his leg" if his garrulous boss speaks too plainly.) But politics indeed plays a large role, as Congress subsidizes favorite industries and the Federal Reserve pursues an expansive monetary policy.